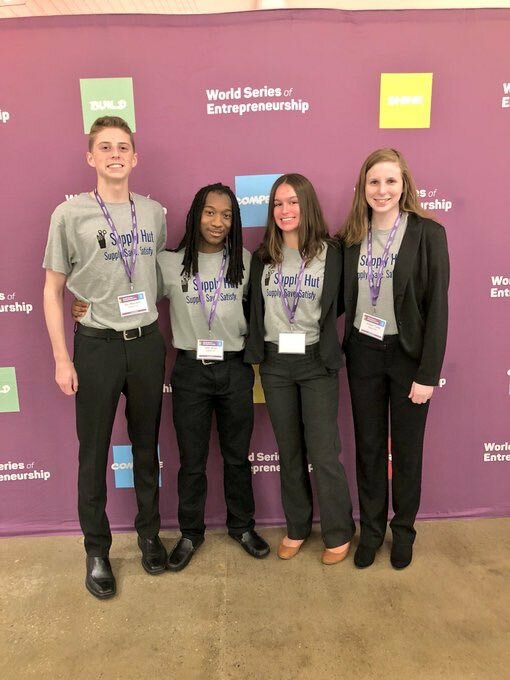 Congratulations to Kempsville High School Entrepreneurship and Business Academy (EBA) students who won first place at the World Series of Entrepreneurship competition – a nationwide venture pitch competition for high school students with $10,000 as the top prize. The four-member team comprised of sophomores Eben Bracy, Ben MacLeod, Afton Mulkey and Kristen Turner took first place for their “Supply Hut” business concept, a subscription-based business to have supplies delivered to teachers monthly. They developed their concept in the school’s INCubatoredu class, which is in the academy’s entrepreneurship and innovation strand. Two other strands, business information technology and corporate finance round out the academy which launched in fall 2016. “My mom is a school teacher and she would always talk about how much money she would spend on supplies, and I really wanted to alleviate the problem for her and her community of teachers,” Bracy said. With that, the concept was launched – but not before doing some initial market research. “We went through multiple ideas and did a lot of surveys and testing to find out what we needed to do to solve the problem and help teachers,” according to Mulkey. Then, the team launched a professional-looking Supply Hut website for potential customers to choose from three ordering options: a gift box ranging from $10 to $20; a standard monthly supply box costing between $20 and $30; and a “Make Your Own Box” where customers could change the delivery frequency as well as customize it to contain more or less of a particular item. All of the boxes could be ordered by anyone to assist teachers, according to Mulkey. In fact, she indicated that in the team’s initial research “a lot of teachers wanted to be able to give other teachers a box” so they added a gifting option. But interest is not enough to cover the start-up costs of a new business so the team also launched a GoFundMe page that garnered $170 of their $300 goal. And to get the word out, they marketed their business by launching a Twitter site, @HutSupply. In early spring, EBA teacher Ashley Houchins, who teaches the INCubatoredu class, encouraged teams to submit their concepts to the competition. 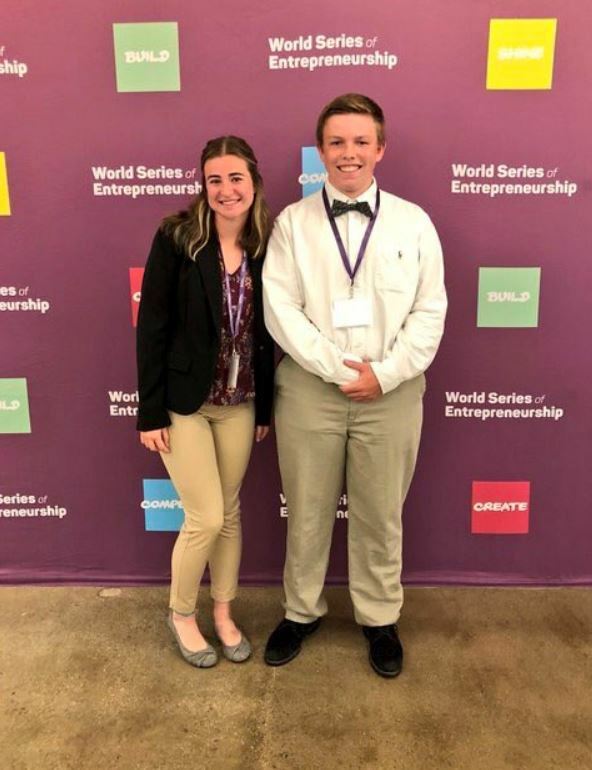 Only 12 teams from across the nation were chosen to do a five-minute pitch at the World Series of Entrepreneurship before a panel of judges – similar to the television show Shark Tank. A select few other teams also were selected, not for the live pitch, but rather to display their work at the event’s Venture Exhibition where they could meet potential investors and business mentors, many who earned their success by opening their own businesses. Kempsville had eight teams selected – three teams to do the live pitch and five to be part of the Venture Exhibition. They did more than good – they won first place which earned them $10,000. Of that amount, $5,000 was for start-up funding for their business and $5,000 in scholarships was for team members to share. In addition to winning the event’s top prize, two other EBA teams in the INCubatoredu class who displayed their products in the Venture Exhibition hall won Excellence Awards. 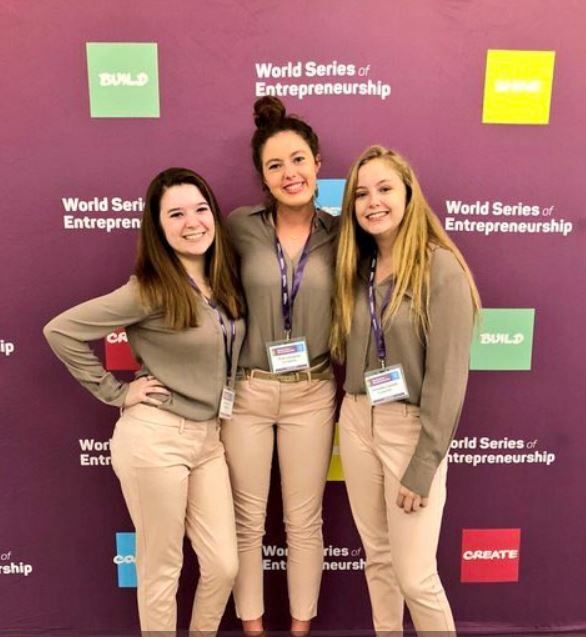 The Cupllabsible team of sophomores Ryle Lancaster, Olivia Smith and Kenedee Cassidy was recognized for their prototype mug that can be collapsed after use and neatly stored rather than carrying around a mug all day. Teammates Sydne Kirkpatrick and Ricky Wynne won for their Klean Kicks concept that deodorizes smelly shoes. Now that they have all completed the INCubatoredu class, these academy students can continue on to Acceleratoredu, another one of the classes in the EBA’s Entrepreneurship and Innovation strand. According to Timlin, in that second-year course the academy partners students with resources and mentors that will help them in managing their business. “We provide them with mentors, lawyers, bankers and connections because they have to create accounts for their business and probably draw up an LLC and all of that takes money that they have to incorporate into their business,” she said. But before the school year ends, the academy will host a Live Pitch event June 6 at 4 p.m. so that friends, families, teachers, staff and others can see the talented students and their ideas in action. The World Series of Entrepreneurship competition was held May 16. Way to go Eben! Bayside Middle is proud of you! Congratulations! Well done, EBA! I recognized a few familiar faces in the article. VBCPS should be very proud of you. Can’t wait to see what you all will be doing as seniors.